Even before it opened, we knew we wanted to review Bar Louie, which replaced short-lived Delaney’s (R.I.P.) in West 7th last year. But what we didn’t know is that the local installment of the Bar Louie chain is actually a great find, even for a beer and pub blog! In addition to their full menu of pretty dang good food, & of course an entire line of mixed drinks, Bar Louie has a great assortment of beers on tap (19 pulls with only two domestic). They do a great job highlighting seasonal and Texas beer (Shiner, Rahr, & St. Arnolds prominantly take their place alongside the likes of Magic Hat, Sam Adams, & Stone brews, and at least five of the pulls are marked “seasonal”). And Louie round out “his” beer selection with a wide array of bottles. Specials include $3 Drafts and other drink discounts, & half-price appetizers, 4-7 every weekday, $5 burgers & flatbreads (Tues), and $10-$15 buckets (Wed). What really intrigued us was the Thursday Special: every week, “Rare Brew Night” begins at 7, when they weekly find “a brew for the most discerning ‘beer snob’.” The night we went, they were prepping to tap Widmer’s Barrel-Aged Bourbon. Definitely worth checking out! While Bar Louie does well with its beer, it’s the atmosphere that will draw us back. Classily clean & swanky, Bar Louie’s interior is filled with rounded booths, long tables, and comfortable leather couch areas. There’s lots of leather, actually. Sleek modern art accents the richwood and mosaic tile. For a large space, they did a good job of filling the space and making it inviting. 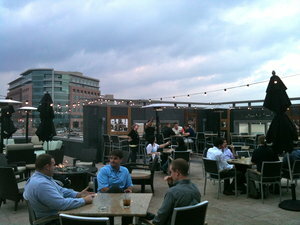 But the pinnacle of the Bar Louie experience is its outdoor patio: the second-story gem, with marble-top tables and comfortable porch chairs, features its own bar and servers, firepits, and a spectacular view of Fort Worth’s redeveloping cultural/museum district. The photo doesn’t do the scene justice – you’ll just have to check it out yourself! The night of our review, everyone from businessmen to hippies found a comfortable spot on the patio, while the majority of Louie’s clientele seems to be a little more on the upscale side. One server told us that by the end of most weeknights, folks from all walks of life end up around one of the firepits, enjoying the outdoor views and sharing stories, laughter, and – of course, whether served in a martini glass or a pint glass – drinks.